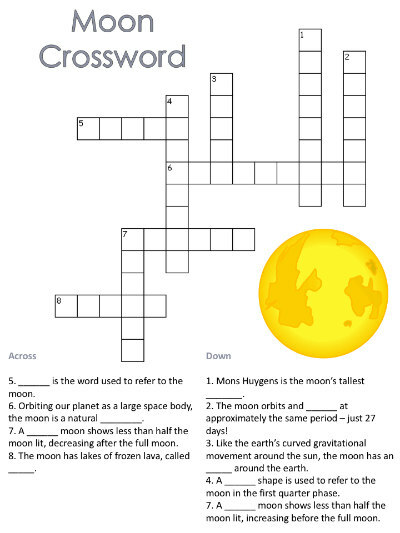 Print out the crossword with words about the moon-- you have a choice between an easy crossword for younger children and a more challenging crossword for older kids and adults. Encourage the children to think and fill in the letters. I think crosswords are a great way to expand and practice vocabulary words and reinforce themes you are studying. children copy the words from the word list into the crossword puzzle. children print the words from the picture clues into the crossword puzzle. children print the words from the word list into the crossword puzzle. children print the words into the crossword puzzle.